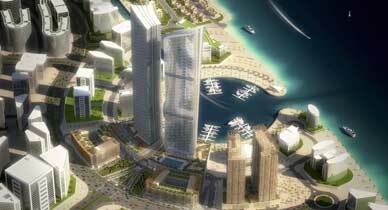 Description: Landscape architecture services for 5 podium towers located on Al Reem Island. As part of Cityscape Abu Dhabi, Dar Al Dhabi is 46,402 square meter development consisting of two 35-story residential buildings (Al-Sharq Tower 1 and Al-Sharq Tower 2), a 7-story residential building (Al-Seef Residential), and a 7-story commercial building (Al-Seef Commercial) in addition to the two 300 meter high ‘Iconic’ towers. A unique, unifying concept of landscape parterres was conceived to organize the plots together and provide areas of respite from the elements. Site design was situated on podiums, roof level and sky gardens integrated within the building. Element ranged from podium and rooftop pools to large vegetation on structure.